There are very few monitor loudspeaker companies around who have the capability to design and manufacture the drivers that are fitted in their cabinets. One of these rarities is France’s Focal, whose high reputation in the audiophile, hi–fi, in–car and studio worlds is due not only to their skills in loudspeaker development, but also to their expertise in driver manufacture. That combination of competencies has enabled Focal to build high–quality studio monitors at attractive prices in their France factory. 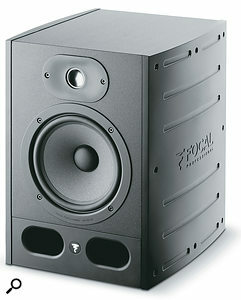 Competitive though Focal’s previous studio monitors may be in terms of price and performance, these products are positioned more towards the professional end of the market, with their cheapest current 6.5–inch monitor (the CMS 65) listing at £1140 per pair. 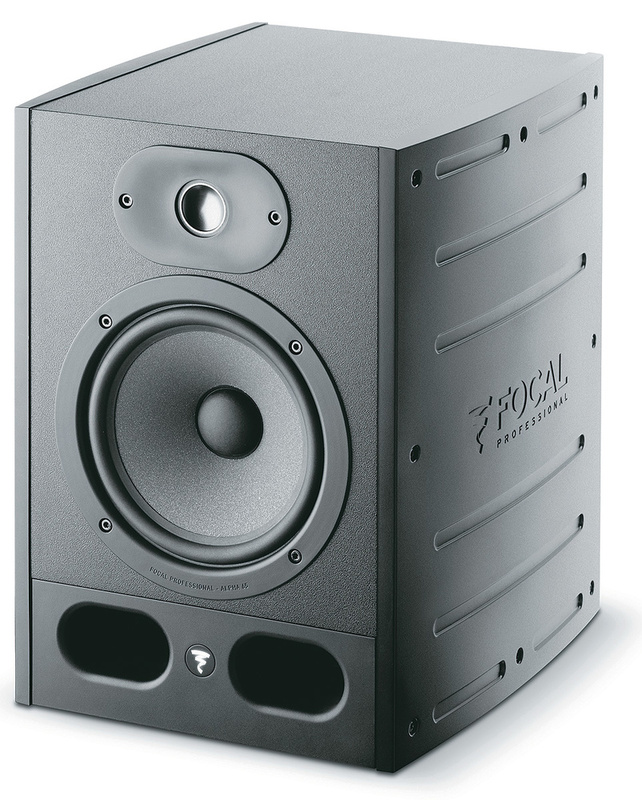 Fortunately for those of us with more desire than cash, Focal have now released the new Alpha range of active two–way nearfield monitors, at prices that are more in line with the budgets of home and small project studios. The Alpha 65, with its 6.5–inch bass driver, sits in the middle of the Alpha range, with the five–inch Alpha 50 (£398 a pair) and eight–inch Alpha 80 (£558 a pair) on either side. Unlike existing Focal monitors, the Alpha range is assembled in China, and their use of vinyl–covered MDF for the speaker cabinet reflects one area of the value engineering involved in this move. However, Focal wouldn’t be Focal without a neat design touch or two, and the cabinets, which are larger and weightier than I had expected, feature bolt–on sculpted side panels that effectively camouflage the simple rectangular box sitting between them. I can’t help thinking that a custom paint job could look fantastic on these panels. Twin front–facing laminar bass–reflex ports exit via a moulded section that extends back into the cabinet underneath the bass driver. 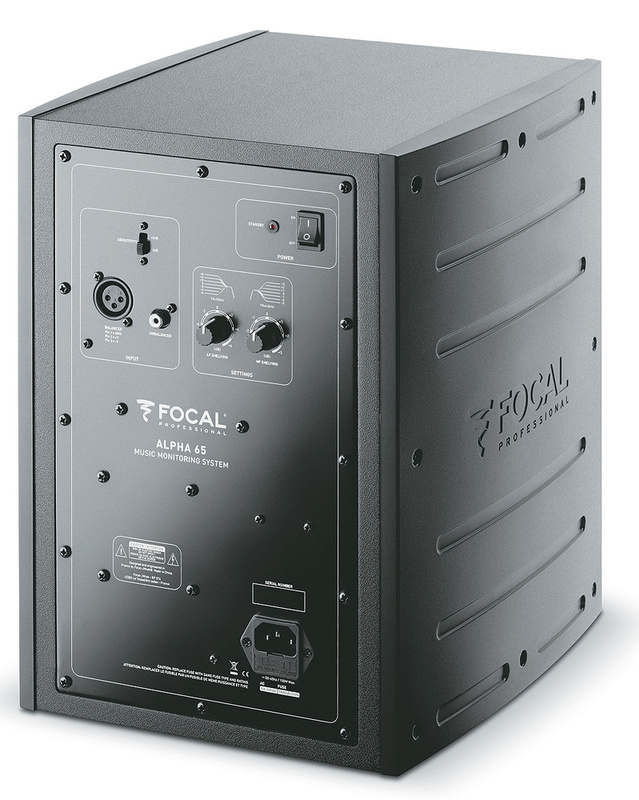 Between these ports you’ll find the Focal logo that is illuminated when an Alpha is active. The treble unit sits in the middle of a small waveguide, and the front–panel line–up is completed by the 6.5–inch bass driver. The bass driver itself features Focal’s proprietary rigid, low–mass Polyglass cone, and the treble comes courtesy of the inverted–dome tweeter that is a feature of all of Focal’s professional loudspeakers. To help keep costs down in the Alpha range, the tweeter is made of aluminium rather than the beryllium used in the higher–priced units. Amplification in the Alpha 65 comes courtesy of two high–current Class–AB amplifiers: 70W for the bass and 35W for the treble. These amplifiers have massive power supplies to deliver the transient response and dynamics required in studio monitors, and also probably account for a good deal of the weight. The amplifiers automatically enter standby mode (indicated by a rear–panel LED) after 30 minutes without an input signal and start up again as soon as an input is detected. Frequency response is quoted at 40Hz–22kHz (±3dB) and, should you want to pump up the volume, the Alpha 65 is specified as being capable of delivering 106dB SPL at one metre — at which point you really ought to be wearing hearing protection. Balanced XLR and unbalanced RCA phono input connectors sit on the rear panel. Both are active at all times, which means that you can connect two sources simultaneously to an Alpha 65. A slide switch boosts input sensitivity by +6dB if needed, and twin shelving EQs with corner frequencies at 300Hz (±6dB) and 4.5kHz (±3dB) allow you to adjust the monitor’s frequency response in order to help correct for any high– and/or low–frequency anomalies caused by either speaker placement or room acoustics — or to tailor the overall sound to your own requirements. The supplied manual gives a comprehensive guide to setting up the Alpha 65 in equidistant configurations for both stereo and 5.1 applications. Essentially the advice boils down to ensuring that the treble drivers are positioned at ear level (even if that means turning the Alpha 65 upside down) and decoupling the cabinets from their stands or shelves using the rubber feet supplied. There is also a useful reminder that, in stereo use, the distance between the monitors determines the width and coherence of the soundstage and that that distance will also determine the length of the sides of the equilateral triangle between you and the Alphas — which, in my studio setup, is approximately four feet (1.22 metres). The rear panel houses the XLR and RCA phono inputs, as well as LF and HF shelving controls.As always, running in is essential in order to allow the monitors to settle in mechanically and to adapt to their new environmental conditions. Focal recommend 20 hours of bass–heavy music at a moderate level for starters. The Alphas improved noticeably during this process, with the bass filling out more and more as time progressed. Personally, I wouldn’t go near the shelving EQs until the Alpha 65 had run in to the point where you can’t hear any more obvious development in their sound, and even then I’d tend to use EQ very sparingly. However, since I could see myself using the Alphas — slightly bulky though they are — for mobile recording work, having these EQs available to help cope with the less–than–ideal monitoring environments that I’ve found myself in over the years would be really useful. The two separate sets of simultaneously active inputs on XLR and RCA phono turned out to be a useful convenience feature, although, just to cater for every eventuality, it would have been nice if Focal had fitted an XLR/TRS ‘combi’ connector instead of just an XLR. I used the XLR inputs for my mixer’s outputs and linked the phono inputs to the Microbook II that I use with my laptop. This arrangement meant that I could work on that computer — which I use mostly for transcribing music and recording rough ideas — without having to switch on the entire studio in order to hear good audio. This setup also allowed me to refer to scratchpad ideas on the laptop as I worked on a track without having to change anything on my mixer, which I personally find to be extremely useful. The first thing that I noticed when I settled down with the Alphas was the scale and solidity of the stereo image. Every element of the soundscape had a real sense of clarity and position. An especially well–recorded grand piano had a sense of reality that I’ve heard only in more expensive monitors. Vocals and other instruments — including percussion — were reproduced with similar transparency and precision when recorded well, whilst any shortcomings were ruthlessly exposed by the Alpha 65 — as they should be. Bass frequencies were solid and well–controlled and there was no apparent lag or smearing due to the reflex port. Electric and acoustic bass guitars and double basses were reproduced with great accuracy, as were bass drums, where both initial attack and body were delivered with power, providing that they had been well–recorded (which I didn’t always feel was the case). Across the mid-range, reproduction was extremely detailed, and this gave vocals, acoustic instruments and percussion a feeling of real presence. The higher mids and treble shared this precision, and the combination helped make low–level detail — such as reverb tails — easy to make out. The Alpha 65 also handled sampled, synthesized and electronic material in the same precisely delineated fashion, and although you’d probably want to add a sub to shake things up with really low frequencies, the Alpha 65 can provide more than enough level and detail in the low bass to let you make mix decisions in the bottom end with confidence. The Focal Alpha 65 delivers a wonderfully detailed, dynamic and tonally balanced sound within a sizeable sweet spot. Although the overall performance is, to say the least, extremely impressive, to my ears the Alpha 65’s aluminium tweeter doesn’t quite manage to deliver the seemingly effortless, smooth top end that I remember hearing from the more expensive beryllium tweeter that features in Focal’s higher–priced monitor ranges. Having said that, to me the Alpha 65 is a very high–quality monitor that, not only, wouldn’t sound out of place in any professional studio, but also that I would have absolutely no hesitation in recording with and mixing on. Given their performance and price, I think that Focal’s new Alpha range will give competitors in the home and project studio market something to think about. In the meantime, if you’re in the market for a pair of monitors at around the £500 mark, you really have to take a listen to the Focal Alpha 65 — I think you’ll be just as impressed as I am. The project-studio active nearfield monitor market is not short of alternatives at the Alpha 65’s price, and you’ll find competition (although possibly with smaller bass drivers) from the likes of Adam, Eve, Event, Fostex, Genelec and KRK. Dynamic, detailed, accurate and balanced sound. Power On/Off switch is on the back. A dynamic, detailed and tonally balanced active nearfield monitor that delivers a professional level of performance at a project-studio price. Definitely well worth auditioning. £478 per pair including VAT.